Argentina teetered on the brink of its second default in 13 years after talks with bondholders collapsed late Wednesday. The setback, after glimmers of hope in recent days that a last-minute agreement could be reached, immediately sent Argentine stocks plunging in after-hours trading. Still, there remained the possibility that talks could resume and a deal could eventually be reached. At a news conference after talks with a court-appointed mediator ended Wednesday, Argentine Economy Minister Axel Kicillof, who had led the country’s delegation to New York, said “we won’t sign an agreement that would compromise Argentina’s future.” A spokeswoman later said negotiations would continue, without giving a timetable. The development is the latest turn in a yearslong battle between Argentina and a small group of hedge funds that have demanded full payment for bonds the country defaulted on in 2001. Argentina has refused to pay, despite an order by a U.S. District Court judge requiring it to pay the hedge funds. The issue came to a head Wednesday as Argentina missed a deadline to make a payment it owed to other bondholders, because the court order had prevented such a move. Mr. Pollack, who had been trying to broker a deal between the two sides, said the country would “imminently” be in default. 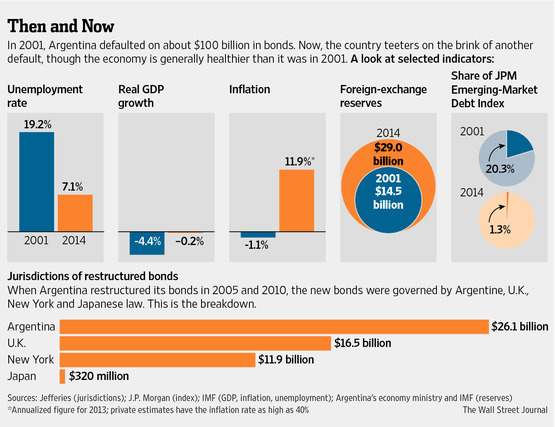 Standard & Poor’s Ratings Services had earlier Wednesday declared Argentina in default on some of its bonds. Next Should You Really Be Concerned About Derivatives ?